Temi Hostel i Kutaisi, Georgia: Bestill nå! We have the perfect location, comfortable beds, the friendliest staff is always ready to help you in getting around or planning your trip or just to share Georgian life experience with Chacha & beer. Our balcony with beautiful view of the city and mountains is one of the best places in Kutaisi where you can find your comfort to just relax and chill out. Superfast free Wi-Fi, Free coffee and tea all day long. Our guests can always feel like at home here and have memorable stay in Temi hostel. 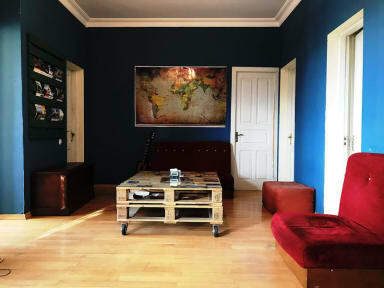 You'll find Temi hostel in the heart of the city, 5 min walk from city center Colchis fountain, 200 meters from central train station, 30 minutes drive from Kutaisi airport. 10 mins walk from restaurants and bars, 100 meters from club Reflector. Temi Hostel offers two double bed room, one 6 bed mixed dorm with 3 bunk bed, one family room with three twin bed, one kitchen, one bathroom, two toilet, one balcony/terrace, one living room. Check out from 12:00 to 16:00. Nice location, friendly atmosphere and very helpful people!